Recently I stumbled on a clear pumpkin pie on the interwebs! Have you seen it yet? I had to do a double take scroll-and-click when I saw it! A c-l-e-a-r pumpkin pie?! Whatthewhat!!???!?!?!? Well, from what I gathered, it seems to be making its rounds at a Chicago area restaurant that is known for its progressive cuisine. Apparently, it involves the elements of a heavily spiced traditional pumpkin pie, that are blended with water and boiled in a special contraption called a “rotary evaporator”. As the mixture boils, the resulting evaporated droplets are collected and mixed with some salt, sugar and gelatin. And served on a pie crust with a dollop of whipped cream. The restaurant even has a recipe for us to try to make this clear pumpkin pie at home. TBH, I sure would love to taste it… wouldn’t you? But, I’m not sure if I want to make the time or financial investment to try and make it myself. Rotary evaporators cost well over a grand and I could think of gobs of things I’d rather spend my money and time on. During the holiday season, I’d rather busy myself with shopping for gifts for family/friends and shoe boxes for a charity drive at our church, and baking gobs of cookies, and attending all those holiday plays and performances! 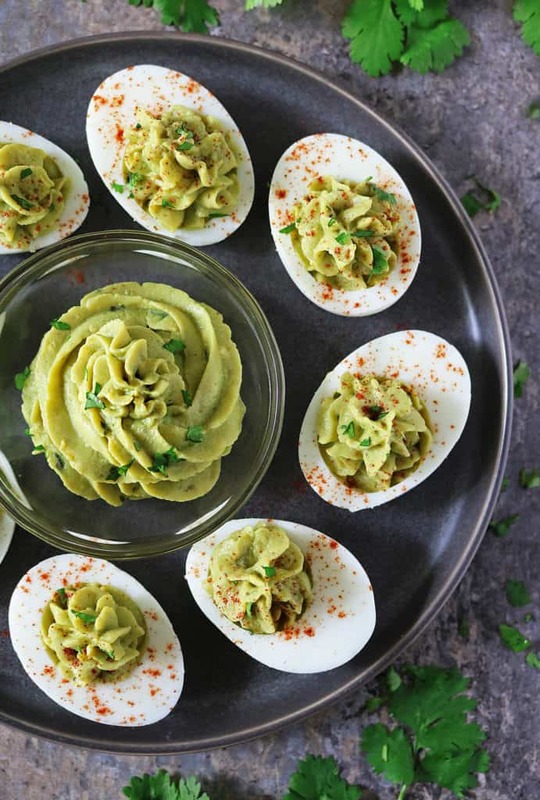 So, when it comes to snacking or even holiday menu planning, I need quick and easy in my life – like these Easy Devilled Avocado Garlic Eggs. 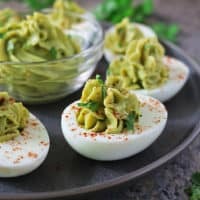 Thanks to WHOLLY® SIMPLY AVOCADO™ dip and spread, which I stumbled on when I was there doing a bit of holiday shopping at Walmart, these Devilled Avocado Garlic Eggs were a cinch to whip up! I just boiled the eggs, scooped out the yolks and mixed them with SIMPLY AVOCADO™ Garlic Herb dip and spread, some mustard and a pinch of salt and pepper, piped them into the boiled egg whites and sprinkled them with a bit of paprika and chopped parsley and …boom! Done! 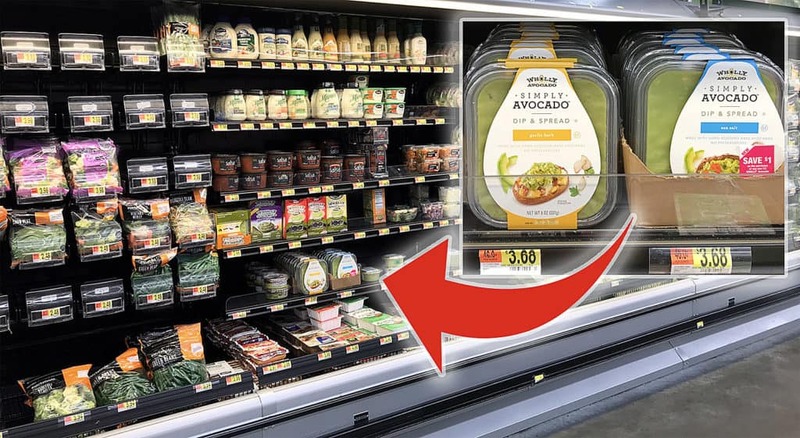 WHOLLY® Avocado’s SIMPLY AVOCADO™ is a pure, wholesome avocado dip and spread with minimal flavor enhancing ingredients. 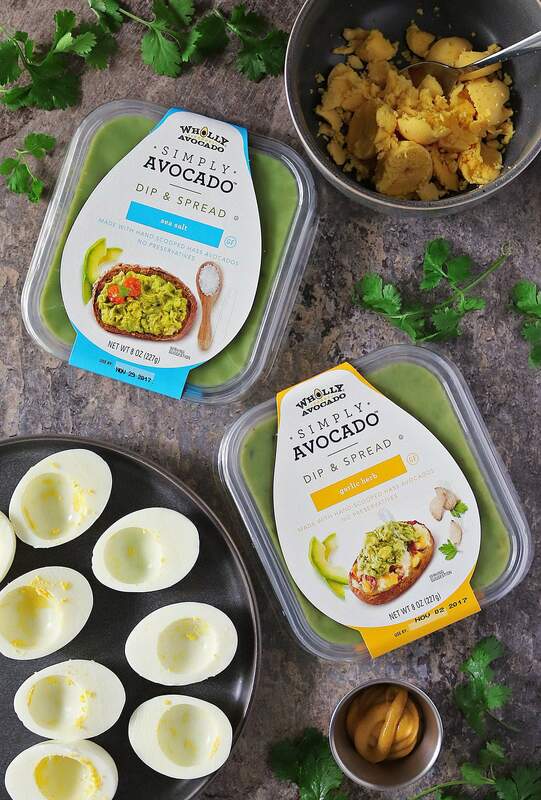 If you want the convenience of a fresh avocado without all the fuss, then grab yourself a package or three of SIMPLY AVOCADO™! Currently, WHOLLY® SIMPLY AVOCADO™ dip and spread come in two flavors: SIMPLY AVOCADO™ Sea Salt and SIMPLY AVOCADO™ Garlic Herb and can be found in the refrigerated bins off the produce section. 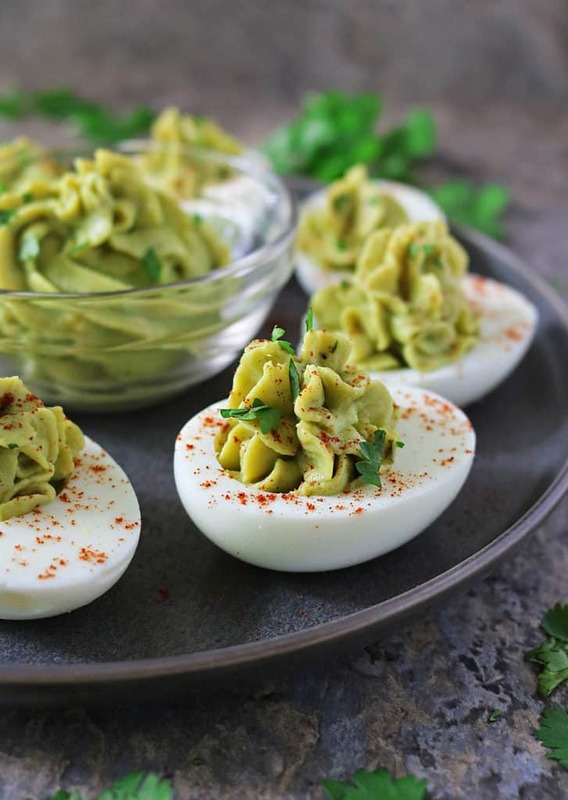 You can find more recipe ideas and inspiration using WHOLLY® SIMPLY AVOCADO™ here and, be sure to follow them on Facebook, Twitter, Youtube, Pinterest and Instagram! 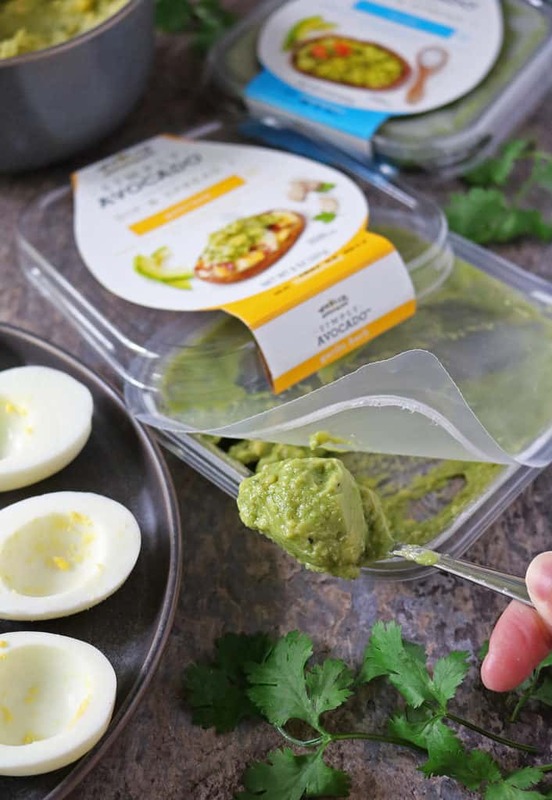 While we enjoyed SIMPLY AVOCADO™ Garlic Herb in these Easy Devilled Avocado Garlic Eggs, my daughter has been enjoying the SIMPLY AVOCADO™ Sea Salt with her morning bagel. She has been saving gobs of time as she doesn’t have to cut around the dark bits that avocados seem to be full of recently! Which means more time for her to spend cramming for her first semester of college finals! Boil eggs and then cut them and scoop out the yolks into a bowl. Add the WHOLLY® SIMPLY AVOCADO™ Garlic Herb, salt and pepper and mustard into the bowl with the egg yolks, and mix well. Pipe this mixture into the boiled egg whites. Sprinkle with chopped parsley and paprika and enjoy! Haven’t heard of clear pumpkin pie! Love to taste it. But, like you, I’m not about to invest in a rotary evaporator. Heck, I don’t even have a pressure cooker! I’m SO BEHIND the times. 🙂 Anyway, super recipe — thanks so much. Easy peasy and so tasty! I just want to dig in! A clear pumpkin pie sounds really intriguing. These look (and sound) AMAZING! 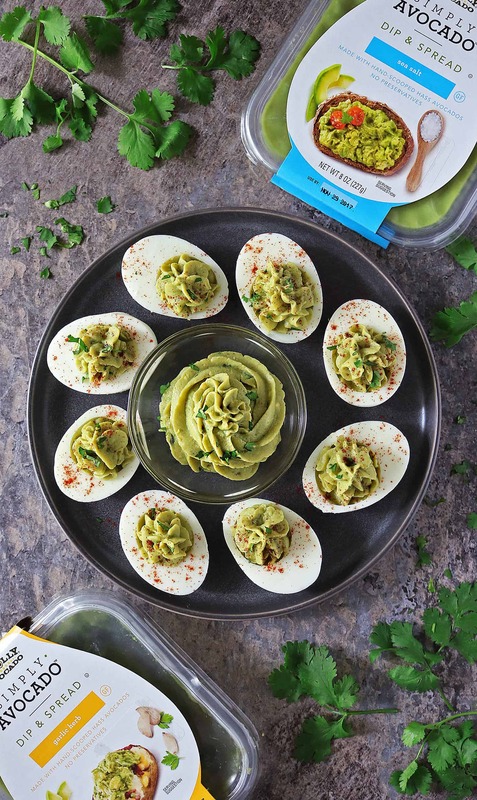 We always make devilled eggs around the holidays so I’ll definitely have to try this spin using WHOLLY® SIMPLY AVOCADO™ Garlic Herb. …now im going to be searching for that clear pumpkin pie. if someone will bring that to me right now, i will gobble it up.